When you’re talking about camping, you’re talking about safety. Venturing into the woods without the proper gear and training could spell disaster. It’s important that you take every scenario into account before leaving and gear for each one accordingly – it might turn a potential disaster into an enjoyable weekend. Let’s focus on emergency water storage containers. As the name implies, these represent an emergency water supply for drinking and cooking, though some are big enough to supply water for days, even weeks. We’ll be taking a look at some of the best food-grade water storage containers on the market and see what makes each one unique and worth paying for. Capacity. Based on the number of people and number of days you’re going to spend on your camping trip, try to calculate how much water you’ll be needing for cooking, cleaning and drinking ( if you don’t have any source of drinkable water there ). These camping water containers come in various sizes, so don’t overburden your vehicle if it’s not necessary. Build quality. How sturdy is the material used in making the camping water carrier and is it safe enough to pack? It’s important that you won’t damage your other pieces of equipment, so just go for the safest choices. Collapsible/non-collapsible. If you’re short on space and have any source of water at the camping spot, you can go for a camping water carrier collapsible system, so that it won’t take a lot of storage space in the vehicle or transportation method of choice. That being said, let’s start reviewing our picks for the best camping water containers! The Aqua-Trainer 7 from Reliance is a great example of a camping water carrier with a tap. Its block shape allows it to fit neatly into most trunks. The tap also allows you to have easy access to drinkable water and the rigid and solid build make the water a bit cooler. The 7-gallon version allows you to store high amounts of drinkable water, so spending a weekend camping with your family won’t be an issue, you’ll have plenty of water for drinking and cleaning. It comes at a very affordable price and, as a plus, it’s made from BPA-free plastic, so the water will be 100% safe to drink. The only downside is that because it’s so rigid, powerful impacts can heavily damage the container. Make sure you store it properly to keep everything safe because this is a great camping water carrier with a tap. Next on our list of water containers for camping is the Coleman Water Carrier 5-Gallon. Coleman is a company that’s seasoned in producing camping equipment, from tents to camp stoves, so it’s natural that they’re also interested in producing water carriers. 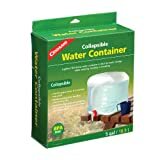 This particular camping water storage container is foldable, so you can conveniently store it when it’s empty, as it doesn’t take up much space. It’s made out of a blend of polyethylene and EVA, FDA-approved, but it’s pretty tough to clean. Don’t use this as your drinking water supply, but it’s really great for cleaning and even cooking. The Coleman Water Carrier is also very cheap, and because it’s already very portable, there’s no reason not to buy it. It can improve your camping experience quite a lot. Reliance Products is a company that manufactures electronics, so it’s only natural that we’d feature one of their products, right? (haha) The Reliance Products Jumbo-Tainer 7 Gallon Jerry Can is a very well-built rigid water container. Our first reason for featuring this product on the best water storage for camping list is the design. The jerry can shape makes it look very sharp, like some piece of serious survival gear. It takes up a bit of space (dimensions 21.75 x 7.25 x 15.5 inches), and that might cause some issues. It’s also very sturdy, due to the quality materials used in its design and it’s BPA-free, so drinking won’t be an issue. The two gripping points are also very helpful, as when it’s filled, it’s pretty hard to carry on your own. It comes with a tap – standard stuff – but this tap might cause some leakage if you don’t properly screw it, so keep that in mind, especially overnight, as you don’t want to wake up to an empty water supply. This is one of the better water containers for camping. It comes at a very reasonable price and can safely store drinkable water for a high number of people. This is especially cool for family weekends and survival-gear enthusiasts, as it looks like something straight out of “The Walking Dead”. One of, if not the, best collapsible water container, the Coughlan’s Collapsible Water Container (5 gallons) is, what we consider, a very good purchase, and we’ll explain why. This water folding water carrier holds up to 5 gallons of water – enough for two adults to spend a weekend camping and have plenty of water for cleaning, drinking, and cooking. The fact that it’s foldable means two things – you can either take it empty and fill it at a reliable water supply near your camp, saving plenty of storage space for the trip, or fill it before you leave and come back with it empty, using the extra space for whatever you gather during your camp. It comes fitted with one molded handle, which makes it pretty easy to handle by one person. The materials are pretty good quality and it’s BPA-free, but make sure you test this water container before leaving, as some users reported leaking in their collapsible water containers, although very few. It’s not that cheap, compared to other similar products, but the camping water carrier collapsible system and design used in this one make it superior. 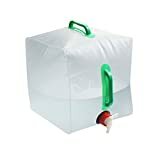 Next on our list of emergency water storage containers is the 5 Gallon Portable Water Carrier Bag – a collapsible water container that’s designed to look like a translucent bag. When empty, it’s very portable, easy to store. When filled, it takes a cube shape, making it easy to place on most surfaces, although try avoiding anything that might pop it, because the PVC fabric used in its design isn’t the toughest. In addition to the somewhat awkward build quality, this bag isn’t vented, so you’ll have to squeeze it for the extra pressure. In a more positive tone, although it’s far from being the best collapsible water container, it is pretty cheap and does offer some utility, especially if you’re on a budget and enjoy the free space you’re getting. Just make sure that you’re going to be sensitive about how you place it and you’ll be fine with it. Let’s start looking at more portable options. 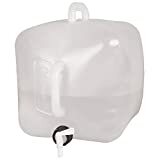 In the market of best water storage for camping, there are smaller alternatives for the 5 and 7-gallon carriers, such as the Lifeunion 5/10 liters collapsible water container – something closer to bottle-size for people who just want some drinking water or maybe just want something lighter for hauling. This camping water storage container is very useful for people who have a cleaning water supply, but still, need to carry some amount of drinking water with them. The Lifeunion is easy to carry, foldable and very, very portable. Both the 5 and 10-liter versions are very, very cheap and they bring a lot of value to the table. It’s also part of the approved food grade water storage containers, so it’s BPA-free. Very portable, very cheap, very good build quality, this is almost an obvious choice for campers everywhere, as you can even use it with a water filter and get an unlimited water supply in a very small package. Our last pick for this review is another folding water carrier – this time, a bucket. A PVC fabric bucket, that comes in both 10 and 15-liter versions. It’s foldable, so you won’t have any issues associated with normal buckets, and it has a long soft grip handle. It only weighs 0.5 lbs and it’s pretty tough. Because it’s a bucket and has such a wide opening, you can clean it very easily, so drinking water is a safe choice, as you won’t get any bacteria due to poor maintenance. It comes with a lid, so transporting isn’t so tough, but it’s also not ideal. This is the best use to transport water from a close source to your camp, much like a normal bucket. Cheap, kind of stylish, durable and easy to clean, this can be a nice, practical addition to your camping setup. Depending on your needs, you’re bound to found something useful in the products listed above. It’s important to keep in mind that all of them are designed using high-quality products. The only thing that will determine which one is best for you is your personal need – find the right one for you and we guarantee that you’ll be happy with it.